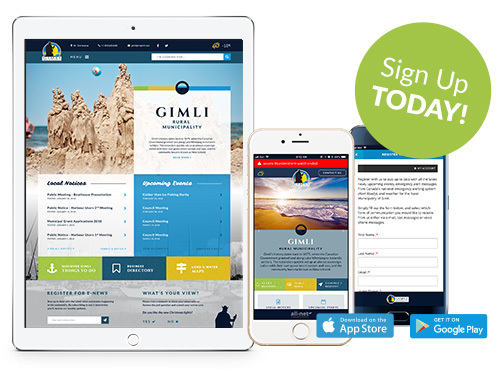 We are pleased to announce the launch of Connect Gimli, our new communication system. Along with a new website and mobile apps we will keep you alerted on the latest news and events, weather and emergency alert messages from Canada’s national emergency alerting system (Alert Ready). You decide how you want to receive information, whether it be by text messages, social media, phone calls, e-mails or any combination you choose. Register with us and never miss out on the latest news, upcoming events, emergency alert messages from Canada's national emergency alerting system (Alert Ready), and weather for the Rural Municipality of Gimli.